We are pleased to announce the release of the ionCube24 app for iOS and Android! 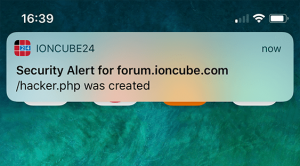 With it, you can access ionCube24 wherever you are and monitor your site for performance and security issues. 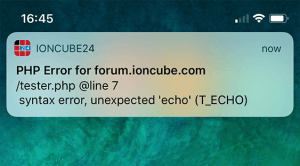 This is a big step forward for ionCube24 giving you ease of access for monitoring your website wherever you are. With notifications and in-app management options you can be aware of issues immediately and act fast. Take a look below to see what the ionCube24 app can do. Access your website security and monitors overview as well as viewing and managing blocked files and notifications. Temporarily disable website security to allow for website changes and view monitoring graphs. View website errors and security notifications as they occur. The ionCube24 Beta app is now available to download.